Intensify your dish's flavor with this culinary pal handmade by Japanese artisans. Underestimate this turtle based on his size? Now that would be a slow blow. He's a lean, mean, grating machine that's built to last. Japanese artisans handcraft each design with meticulous attention to detail. They cut the sweet silhouette from a strip of rolled copper, plate it in tin, and punch each tooth by hand. 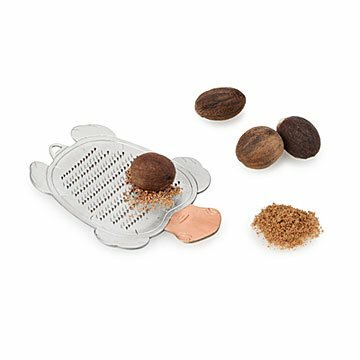 Excellent for mincing nutmeg, ginger, and lemon zest, the copper teeth slice food without crushing it the way some plastic graters can. That precision allows the ingredient's unique flavor to shine through in your dish. Your new culinary pal also features a curved tail, so he can hang out—literally—between meals. Give one to your favorite chef or friend looking to boost their nosh routine. Handmade in Japan. Hand wash only. Dry thoroughly with soft cloth immediately after washing to keep copper from oxidizing.